Sometimes, inspiration can happen when you least expect it. And if you’re Michelina Docimo, a writer who has been previous contributor to this site and a certified sustainable building advisor, that Eureka! moment took place at the Bartlett Arboretum & Gardens in 2009. That year, there was an exhibit of artist Kathy Hirshon’s hand-painted panels of wood in diptychs and triptychs called Spirited Trees. It was a one-woman show that Hirshon created specifically for the Bartlett. Initially, she was thinking of working with other mediums like silk or leather. Then, she said she had her own Eureka! moment. And when she did, she felt like a channel for what was produced. She used watercolors and ink as well as a wood burning tool. One line led to another and another. A nose in one piece became an eye or an ear in another. It all just flowed together. That’s exactly what captured Docimo’s attention. While she was covering the exhibit for an article in ARTES Magazine, she found it spiritually moving in a surprising way. Because of Hirshon’s work, she came to the realization not only are these trees a part of nature but so are we. We are all one. We are all connected. That is one of the key elements in Hirshon’s core beliefs. She said that all life is connected and we are all one mind. Docimo clearly got the message, but she took it one step further. She wrote a book of stories and poems, Echoes: Listening to the Voices in Spirited Trees, based on Hirshon’s work that included interviews of some of the regions spiritual heroes: a rabbi, a jewelry designer, a childbirth educator, a vegetarian chef and author, and many more. Some of the most successful businesses today grew out of the Great Depression. That's right. Fortune magazine is one, and there are many more. For where there's a meltdown, there is space for innovation and determination to grab a foot hold and climb out of the rubble. So go ahead, put your thinking cap on and grab a copy of "75 Green Businesses You Can Start to Make Money and Make a Difference," by Glenn Croston, Ph.D. It outlines opportunities, describes current and projected market need, what you need to know to get started, what kind of capital is required, and some of the special challenges you can expect along the way. Glenn was kind enough to spend some time with CT GreenScene to give us some insight into where he thinks things in the green business arena are heading. GS: What specific industry is leading the way in the green revolution? GC: Renewable energy is poised to make a bigger impact than ever on the economy and the health of the planet. Solar, wind, and other forms of renewable energy have a number of factors that will support their continued rapid growth, even in the face of the current economic turmoil. Providing cost effective clean energy will help our national security, fight climate change, create jobs, and get our economy back on track. GS: What are your favorite big name companies with bold initiatives? GC: Green leaders like Gary Hirshberg at Stoneyfield Farms and Ray Anderson at Interface have shown that they can grow a successful business while still doing the right thing for the planet. They have been taking the lead and providing it can be done, which is pretty bold. The many car makers poised to transform our automotive industry are bold players. If the big automakers like GM can't do it, it will leave the opportunity open to small companies like Aptera. When the auto industry emerges from its current trials with a new variety of electric cars and plug-ins coming to market, it may look very different than it does today. GS: What's a promising green product or service? Okay, so you may not have gone to Harvard for an MBA or maybe you did--but either way, Harvard Business School Press has books in a paperback series called Ideas with Impact. The Harvard Business Review on Green Business Strategy is a general management book that will help get you up to speed. Do you know your LEED from a USGBC? Do you know what the BREEAM is? Did you know that green buildings increase employee productivity? Did you know that Toyota has shared its green workplace best planning practices with Disney, and the New York Times among others? Get a cup of coffee and read the chapters that interest you the most, but especially, "Building the Green Way" by Charles Lockwood and "Beyond Greening: Strategies for a Sustainable World" by Stuart L. Hart. Hart says, "When greening becomes part of strategy, opportunities of potentially staggering proportions open up." And adds that Xerox is reusing parts from leased copiers on new machines. It's a start. Now that Santa has gone green, it'll be the Easter bunny's turn. Santa Claus is now teaching children to be eco-conscious in a new book called, When Santa Turned Green, by Victoria Perla and illustrated by Mirna Kantarevic, is intended for young children whose parents struggle with how to explain the environment, practical green tips and global warming. "I wrote this story to teach my children about a serious issue in a non-scary way," Perla says. Global warming for a the four-year- old, who just wants to discuss the latest Power Rangers toys and Madame Alexander dolls. Wow! Even Former Vice President Al Gore would approve and he did, saying "When Santa Turned Green helps even the youngest child grasp the importance of caring for our planet and solving the climate crisis." Perhaps Mrs. Claus is secretly pining for BMW's new Hydrogen 7, instead of that old sleigh she's had for years! Want to Understand Your Carbon Footprint? 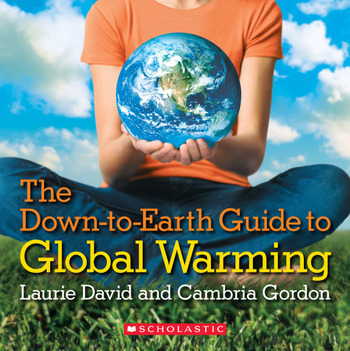 Then read the Down-to-Earth Guide to Global Warming by Laurie David and Cambria Gordon (Orchard Books/Scholastic $15.99 and worth every penny). Oh yeah, and don't forget that this is supposed to be a children's book. But the book should be required reading for all kids 8-100. This colorful and nicely designed book is a must read for children and yes, even adults who could use an easy-to-read primer on today's environmental problems. If we want to educate ourselves and our children, this book covers the science of global warming, the effect on our weather, the impact on plant and animal life and the many steps we can all take to help reverse global warming. When asked about her favorite green products, author Cambria Gordon said, "My favorite green products are bio-bags . They are completely bio-degradable and great for lining trash cans in the house. I also can't live without my SIGG stainless steel water bottle. Mine says "Simply ECO Logical."